A common view in recent years has been that the effectiveness of development assistance is reduced when donor countries fragment their contributions across many recipients and when there are many donors active in the same place. This column reports that research indicates only few negative effects of aid fragmentation on outcomes such as growth, educational enrollment and bureaucratic quality, except in circumstances where recipient countries lack adequate administrative capacity. The specific context is key to whether aid fragmentation harms or benefits its recipients. Generally speaking, even for donors, competition is not necessarily undesirable. For many years, donors have been preaching competition and free markets as remedies for weak economic growth in developing countries. National and international competition spurs innovation, economists would usually argue, and ensures value for money for those looking to acquire goods and services. But following the Paris Declaration on Aid Effectiveness in 2005, this spirit drastically changed – at least as far as the donors’ own interventions are concerned. Ever since, the regular peer reviews by the OECD’s Development Assistance Committee (DAC) have criticized donors for fragmentation of the aid they provide across many countries, which in turn leads to many donors being active among the same recipients. The DAC published performance indicators based on the number of donors in a given country, suggesting that donors should divide the world into different spheres in which each of them could concentrate their aid. This would also reduce the extent to which recipient governments fail to comply with the conditions that donors set. In essence, this is a call for donors to build ‘the cartel of good intentions’ as one provocative paper was titled over 15 years ago. But where is the focus on ‘recipient ownership’ and ‘recipient governments in the driver’s seat’ that appeared to be so important for aid effectiveness in the late 1990s and early 2000s? At first glance, it seemed as if this change in focus had obtained a seal of approval from the academic world. Yet on closer inspection, scientific support that demonstrates the harmful effect of donor fragmentation for aid recipients has been only partial and weak. Studies have focused on how fragmentation reduces bureaucratic quality in the poorest countries or – through the specific choice of the fragmentation indicator – on the beneficial presence of a ‘lead donor’. But they do not lead to the conclusion that the bulk of donors should be pushed out of the country. It is certainly true that the multiplicity of rules and regulations that different donor agencies request can be a strain for a poor country’s overloaded public administration. Harmonization of rules and procedures across donors following best practices is therefore clearly advisable. But harmonization is not the same as restricting the number of donors. For example, not all recipients are equally lacking in the capacity to work successfully with numerous donors. In a study for the German Technical Co-operation Agency (now the German Agency for International Cooperation), we highlight these differences in two country case studies: Vietnam and Burkina Faso. In contrast to Burkina Faso, officials in Vietnam report that having many donors in the country is useful for them in multiple ways. In particular, they learn how to interact with them most effectively, which then becomes useful for negotiations in other areas such as trade and foreign direct investment. Different types of effects – on growth, bureaucratic quality and social sector outcomes. Different channels of influence: reduced aid effectiveness or negative direct effects of the presence of many donors, for example, through conflicting advice from donors or in the conditions that they impose. The world map in Figure 1 illustrates how different concepts of fragmentation lead to different measures and rather different conclusions about the degree of fragmentation in recipient countries. It shows the country-specific degree of fragmentation using four different indicators, all ranging between zero and 100. The Herfindahl index measures the probability that two randomly drawn US dollars from the overall aid that a country receives result in two dollars from the same donor. It is the most frequently used indicator in academic research. The concentration ratio adds the share of aid that the three largest donors in a recipient country give as a share of the total aid this country receives. It only considers fragmentation as a problem after the number of donors exceeds three. A third widely used indicator simply counts the total number of donors that give aid to a recipient country (‘total number of donors’). It is simple to calculate but treats all (small and large) donors as equally problematic. Our final indicator (‘small donors’) instead only views small donors as the problem. It measures the number of donors that together provide less than 10% of a recipient country’s aid. While fragmentation indices based on the Herfindahl index and the concentration ratio are large when there is no lead donor (or no small team of lead donors), the donor counts turn large when there are many additional donors contributing marginally to the overall volume of aid in the country. If the latter do not create much of a burden, because they simply align themselves with the larger lead donors, fragmentation indices based on the Herfindahl index and the concentration ratio should be relevant; otherwise, the opposite might be true. Figure 1: Aid fragmentation by recipient for four different indicators. Legend: Differences in the geographical occurrence of fragmentation. The five categories are formed so that each category has an identical interval of its respective fragmentation indicator (e.g., Low: 0-20, Rel. low: 21-40, Medium: 41-60, Rel. high: 61-80, High: 81-100). This representation simplifies the interpretation and allows shares and degree of fragmentation between countries to be directly compared. Figure 1 shows that differences in the measurement of fragmentation are substantial. For example, most of Asia appears to be more fragmented than Africa and Latin America when looking at the indicators based on donor counts. In contrast, Asia seems less fragmented when focusing on the lack of lead donors. It is thus highly problematic to use these different indicators while presuming to speak about the same problem. 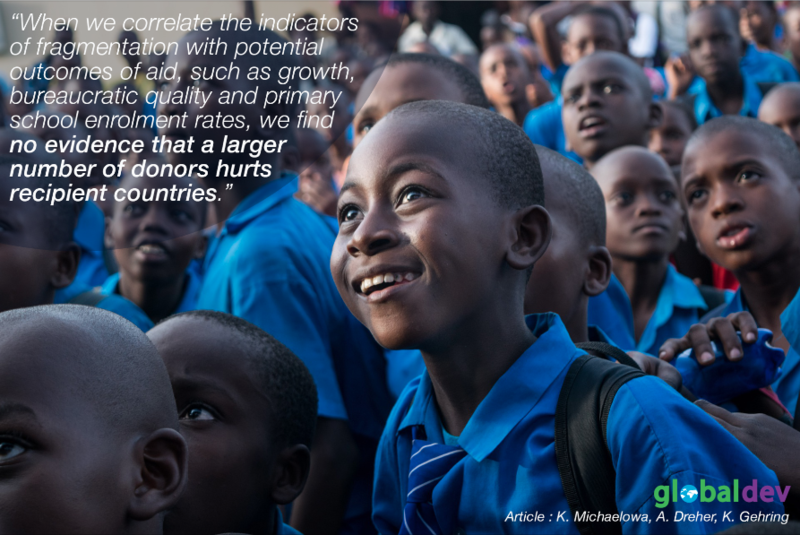 When we correlate the indicators of fragmentation with potential outcomes of aid, such as growth, bureaucratic quality and primary school enrolment rates, we find no evidence that a larger number of donors hurts recipient countries. The lack of lead donors reduces economic growth, but we do not find negative effects on bureaucratic quality or education. What is more, the negative effect on growth is due to the reduced effectiveness of aid, rather than to a direct negative effect of fragmentation. In contrast, increased fragmentation – in terms of both donor numbers and reduced concentration – appears to be beneficial rather than detrimental for educational enrolment. This may be because in social sectors, recipients have long adjusted to the traditionally very large number of donors there. This means that bureaucratic inefficiencies are minimized and dominated by the positive effects of competition. More generally, negative effects of fragmentation tend to be more pronounced (and positive effects less pronounced) when the recipient country lacks administrative capacity from the outset. Initial capacity affects the role of fragmentation for growth, bureaucratic quality and primary school enrolment. In summary, our study shows that the specific context, in terms of both country characteristics and sector choice, is highly relevant for determining whether fragmentation hurts the recipients of development aid. Perhaps even more importantly, the DAC-promoted simple indicators based on the number of donors in a country may be highly misleading. Consequently, the sweeping conclusions on supposedly negative effects of aid fragmentation sometimes drawn from earlier research should be avoided. Even for donors, competition is not necessarily a bad thing, and should not generally be considered undesirable. Kai Gehring is a Senior Researcher in economics at the University of Zurich, funded by a 4-year "Ambizione Grant" of the Swiss National Science Foundation (SNF). His main research interest are (international) political economy and economic development, with a special interest on questions that relate cultural and psychological aspects to economic or political theories and integrate them into empirical analyses. Katharina Michaelowa is Professor of Political Economy and Development at the University of Zurich and at the Center for Comparative and International Studies (CIS) at ETH and University of Zurich. Her research focuses on the effectiveness of development cooperation as well as on the effectiveness of developing countries' own policies, especially in the social sector.